For more than 40 years vacationers and residents have been ducking into Wee Winks Market for everything they need for the kitchen, cooler and beach. Situated right in the heart of the village, Wee Winks Market is super-convenient for finding supplies, food and groceries for your Outer Banks vacation in Duck NC. There’s no need to leave the village to find the groceries you need for the rental house. Wee Winks Duck NC Market stocks grocery items for breakfast, lunch, dinner and snacks, along with convenience items. Whether you need staples like bread, milk, cereal and coffee or gourmet foods like cheeses, crackers, Duck NC wine and craft beer, you’ll find it all at Winks. 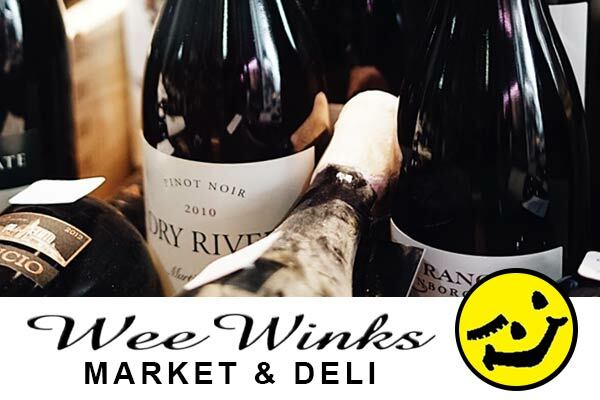 Wee Winks Market also stocks essentials like ice, bottled water, condiments and spices, toilet paper, over-the-counter medicines, cleaning supplies, bug spray and more. If you’re hungry, Wee Winks Market is more than a Duck NC grocery store, it’s also a deli. You’ll find Thumann’s deli meats and cheeses. With its assortment of prepared salads and sandwiches, drinks, snacks and baked goods, this is the place to stock up for a picnic in Duck NC. It’s also the place to stock up for a cookout; choose from Hereford steaks, hamburger meats, chicken and hot dogs. See the Wee Winks Menus page. Large selection of Thumann's deli meats to choose from! Find everything you need for the beach! We have an extensive selection of pastries and baked goods to choose from! Call ahead and get enough for the house to go! Come in and get your morning java with us! Come on in and check out our new building! Allows us to offer you more! Come in and check out the largest wine selection in the Town of Duck! Get ALL your OBX souvenirs right here! You will find something for everyone back home! Deli Sandwiches made fresh daily! Come on in and get everyone's lunch for the beach! Largest craft beer and wine selection in the Town of Duck!